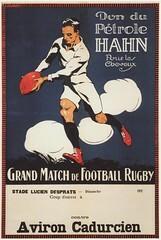 "La Manière Bayonnaise" ("The Bayonne Method" so to say...) is a milestone in French rugby, laying the grounds for an open passing game... and "French Flair"... written in 1913 by Fernand Forgues, captain of Aviron Bayonnais, French Champion 1913, and his two brothers and teammates Jules and Charles. 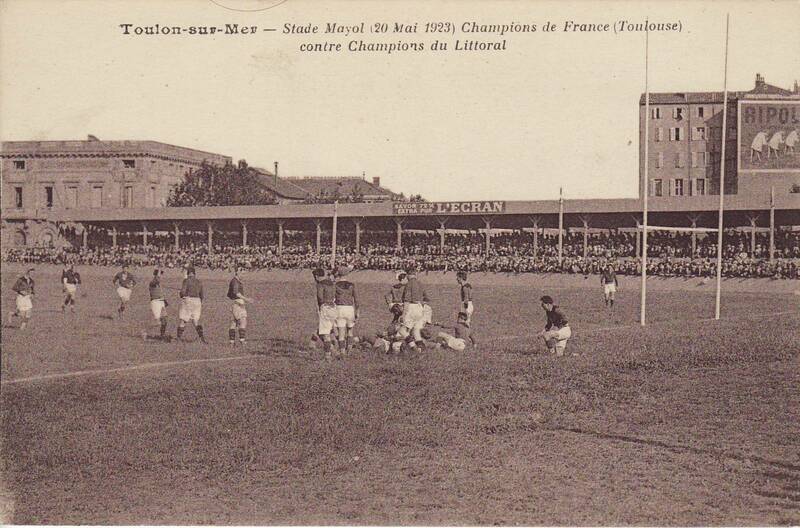 The original cover picture shows the arrival of Aviron Bayonnais in Colombes, before their (winning) final vs SCUF on April 6th, 1913... "Les Gallois de France" (the Welshmen from France - read that former post for more!) as a fine synthesis! This said, you could check Roe's photographies (and signature) on my Flickr, or read this old story (2007) introducing this gentleman from Penarth who had settled in Pays Basque... Much more to come ! A last one - but a great one! 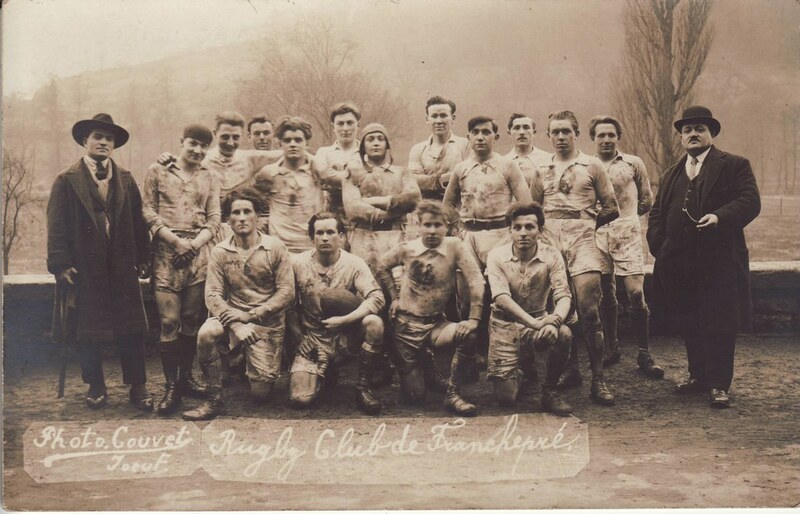 - before leaving, courtesy of Gallica / French National Library, showing Roe (wearing a hat) and Jack Bancroft in Paris, in March 1922, before France v Wales. June 9, 2012 : This afternoon, Stade Toulousain and RC Toulonais will play the final of French championship. There's a lot a expectations around this game... two high places of French rugby... passionate fans on both side... Red & Black for everybody ! Parce que Toulon - Rouge ! Because Toulon - Red! Parce que Toulon - Noir ! Because Toulon - Black ! Parce que Toulon - Rouge & Noir ! Because Toulon - Red & Black ! NB : shame on me... I can't refrain from linking to one of the worst-but-famous French song from the 80s... Jeanne Mas "En Rouge et Noir" (in Red & Black)... shame !! 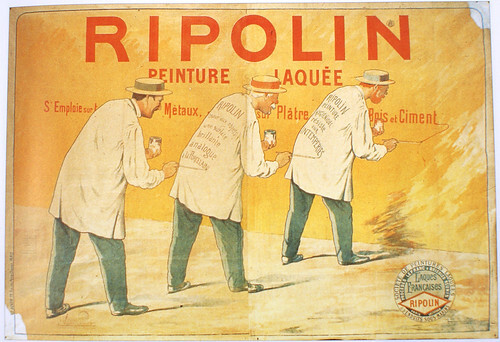 Third card reads "After - Mr Fallières' triumph"... and is self explanatory! For an "ordinary" amateur club rugby player here in Europe, Easter usually means that your rugby season is over, i.e. that you're not qualified for the final rounds of your local championship... I hate Easter!! This said, I have no idea why "The Red Virgin" was impersonated as "Zezette" (quite a stupid nickname in French...) on this local postcard published a few days after the final! Seven men from this final were soon to killed in action during ww1. Let's remember them: Joseph Servat, André Moulines and Alfred Mayssonnié for Toulouse... Marcel Burgun, Paul Descamps, Pierre Guillemin and Gaston Lane for Paris... (not forgetting Géo André, k.i.a. during ww2). 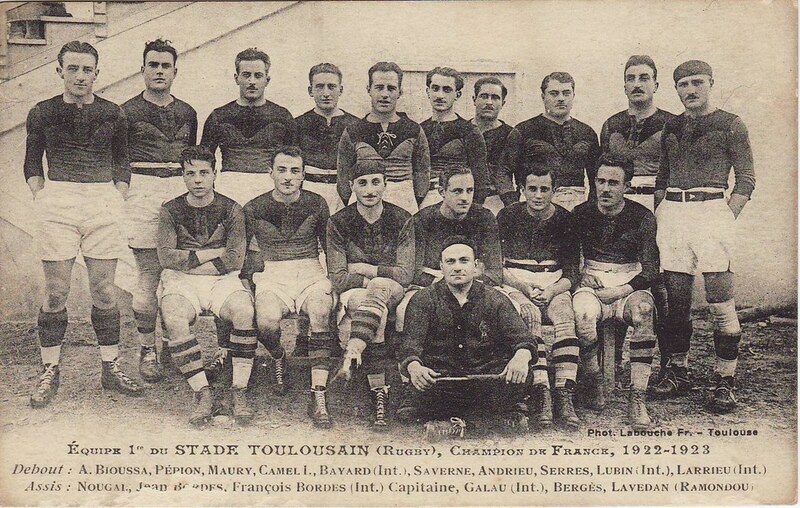 And special mention to Marc Giaccardy, the referee of the 1912 final wearing jacket and cap on the postcard above.... Giaccardy, journalist by profession, five times champion with Bordeaux between 1899 and 1909 (stats here), died in 1917 during the Battle of Verdun. His grave in a forest nearby was honoured some months ago by the local rugby committee (cf pictures in my ww1 forum in French here + local newspaper report). 1905.. the middle of first Welsh rugby "Golden Era"... Triple Crown (6 times between 1900-1911) and only team defeating Gallaher's touring All Blacks... Country of leading Rugby Clubs (Swansea, Cardiff, etc)... Home of technical innovators (cf Gwyn Nicholl's "Modern Rugby Football") and talented footballers!! Or we could also think of the cigarette card series - the very same rugby kit imho - published in 1895 by Thomas Ogden of Liverpool to promote his "Otto de Rose" perfumed cigarettes for women. Possibly the rarest (and the most expensive...) of all rugby cigarette cards sets ! BTW I'm quite sure that the same artist (from Liverpool ??) did the artwork for this cigarette cards and my die-cuts... wonderful rugby kit! No, this is not my bet! The teams line-ups remind us that attacking organization was evolving at this time... England was here playing with the "classical" organization consisting in 9 forwards, 2 halves, 3 three-quarters and 1 fullback, whereas Wales - under Arthur Gould's leadership (details here) - was starting to play with 4 three-quarters (thus 8 forwards) to promote the passing game. I've outlined these players because they all appear (with others... I'm not listing them all...) either in this fantastic "Famous Footballers" (preview here) or in these no less fantastic Baines cards displayed in my previous post... Rugby Stars! Enjoy the game tomorrow ! I love Baines Cards !! +100 Baines Cards... late XIXth - early XXth c. ... for serious rugby collectors ! I've started to place these pictures on a map but there's still a lot of work to do! So... here is a series of 10 rugby cigarette cards published in 1912 by Gallaher (London and Dublin), part of "100 designs Sports Series"
And I've also packed the cards into a 1min video... Enjoy!